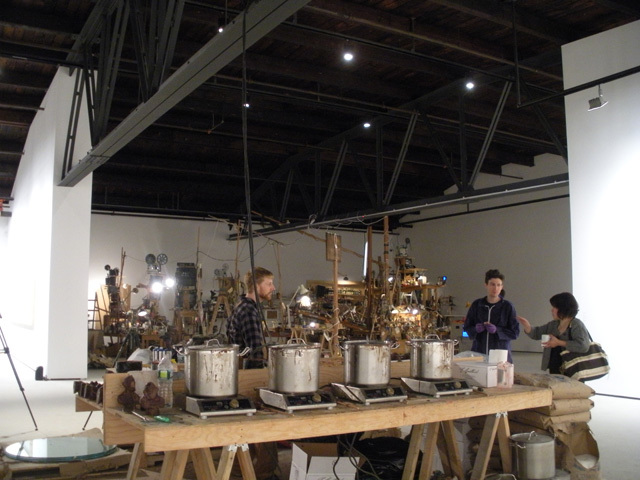 Yesterday afternoon, Hauser & Wirth opened the doors to its new space in Chelsea for a preview. The gallery’s only home until now in New York has been a townhouse on the Upper East Side, which, like all buildings of its sort, makes for a narrow, multilevel (and sometimes fragmented) art-viewing experience. 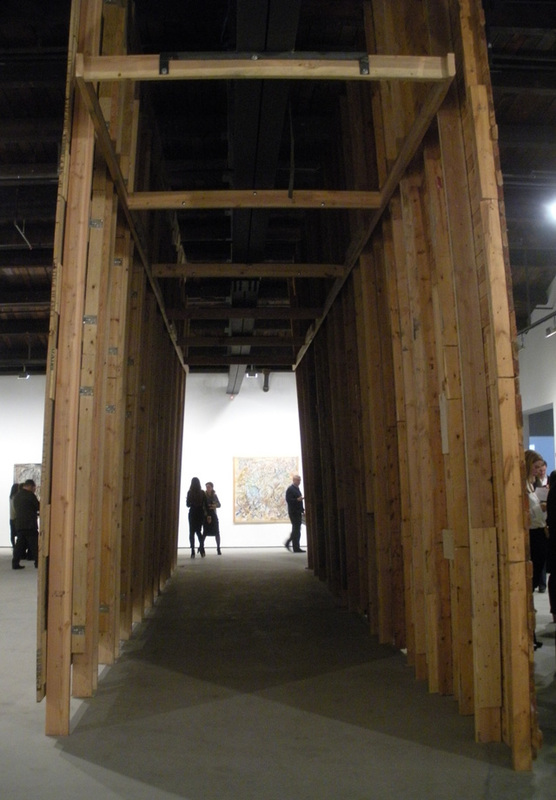 The new gallery, the site of the former Roxy nightclub and roller rink on West 18th Street, is pretty much the opposite — a cavernous warehouse that, although it’s technically only one floor, seems to expand and spread in every direction. 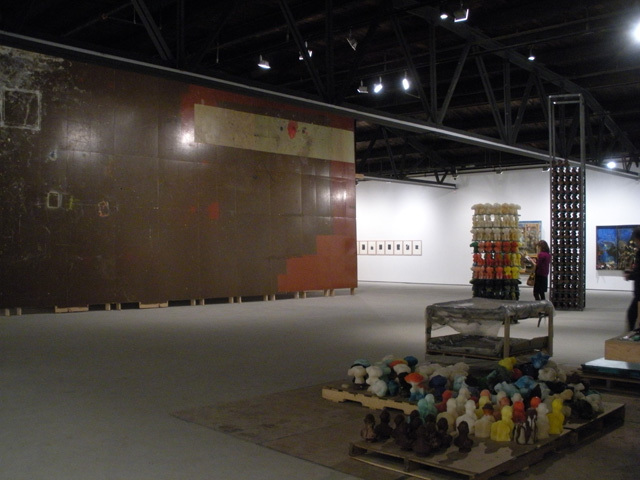 The gallery is opening with a show devoted to Swiss artist Dieter Roth and his collaborations with his son, Björn Roth. A somewhat abbreviated visit left me with the impression that this is a fantastic exhibition, and a great choice to inaugurate the space. 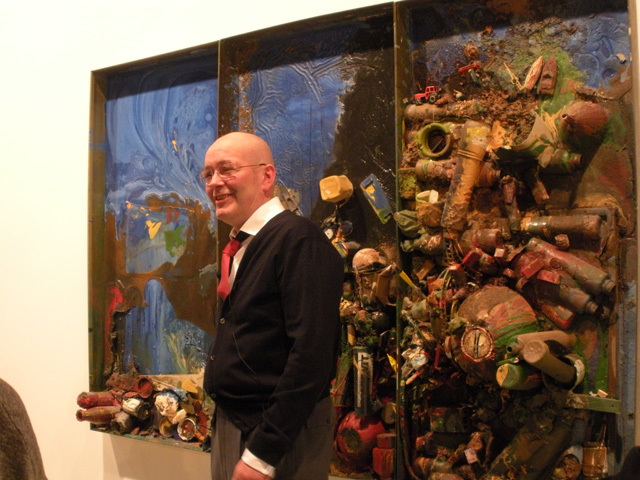 Whether it’s “Large Table Ruin,” a sprawling installation made from the accumulated tools and miscellaneous studio detritus that seems to have a mind of its own; an assemblage made partly from junk and paint cans and toys; or a painting that includes plastic tubes and is activated by pouring liquid into them, Roth’s work is rough to its core. His aesthetic is one of controlled chaos, an embodiment of the provisional, and his palette full of browns and tans and earthy colors. All of this fits well with the feeling and architecture of the former nightclub — in addition to things that just fit, quite literally, in there, like Roth’s “The Floor” pieces, which are composed of two floors from his studio in Iceland. 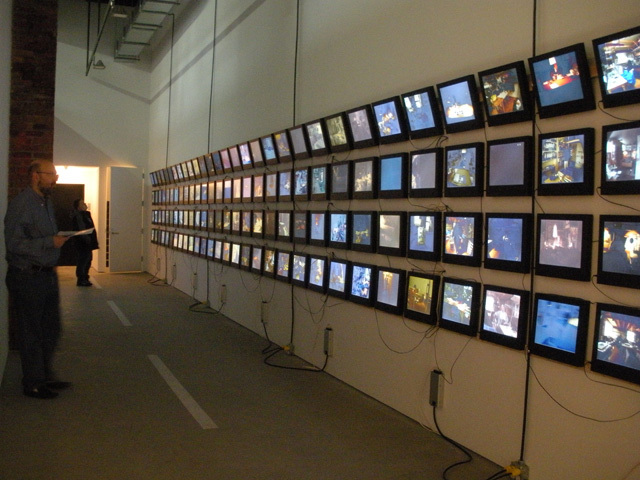 On a brief walkthrough of the show, which unfortunately was largely drowned out by noise from non-listeners and the echo of the space, Björn explained that his father had originally upended and installed the floors as artworks in 1992, when he was having an exhibition in Switzerland and didn’t have enough work to fill the giant space. I can’t help but take this as confirmation that by continually creating and opening huge spaces, the art world is encouraging artists to basically go big or go home — but that’s another story for a different day. The second generation Roth and one of his sons, Oddur, also created a beautiful site-specific bar for the gallery, a permanent installation located in a little nook in the southeast corner of the space. 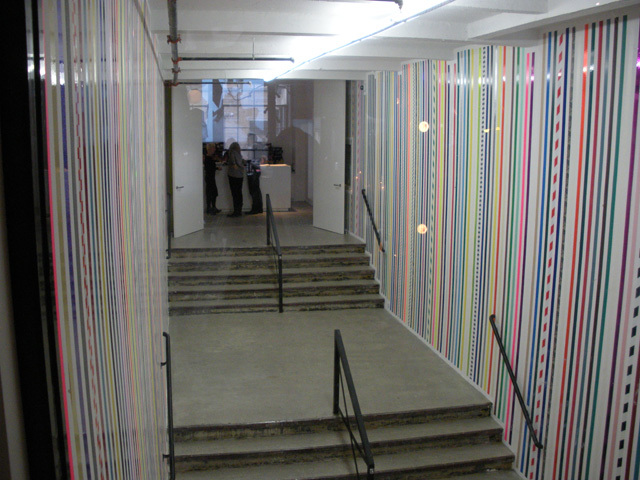 To get to it, you traverse another permanent installation, Mary Heilmann’s “Two-Lane Highway” painted on the floor, while one of the bar’s windows overlooks the third permanent installation, a gleeful striped tape piece by Martin Creed that decks the entrance hallway and stairs. 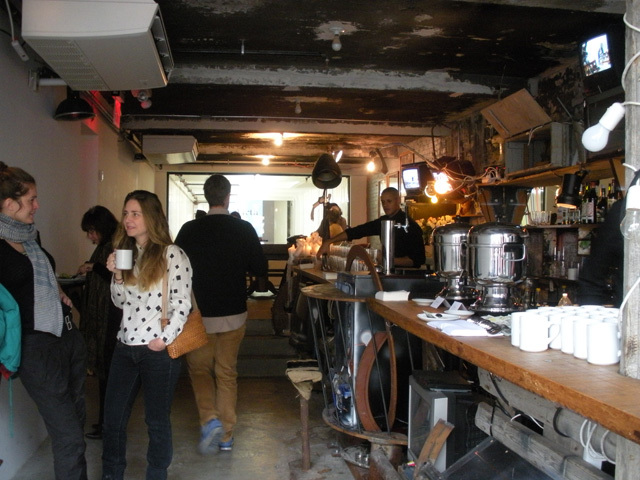 The bar was the subject of much conversation among the assembled writers, artists, and others — I suspect because its dark wood, jumbled candles, coziness, and slightly underfinished feeling make it exactly the kind of place you’d want to hang out in (if only it were in Brooklyn …). Also because most of us will never actually get to hang out there: like so much of the art world, the bar won’t be open to the public, only accessible for special occasions. Hauser & Wirth’s new space at 511 West 18th Street (Chelsea, Manhattan) opens to the public tomorrow, Wednesday, January 23, with the exhibition Dieter Roth. Björn Roth.